A smart, bright, food-driven place that knows its market and caters to it well. Whether you're ensconced in the powder-blue and cream bar (with a fire in the grate at the far end), on the trellis-shaded terrace in summer, or in the country restaurant, the food is to savour, and the Tribute and Old Speckled Hen are matched by decent wines. The menu covers international as well as pubby treats (Aberdeenshire rump steak; crayfish and cress breaded scampi with lemon and lavender dressing; sticky toffee pudding with clotted cream ice cream) and executes both with aplomb. The culinary innovation extends to the vegetarian options, perhaps a filo tart of crushed carrot topped with a poached egg, courgette strips and rocket pesto. A slick operation out in the country, warm, friendly and relaxed. 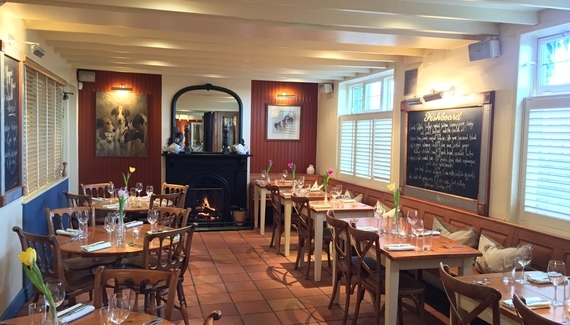 Have you visited The Malt Shovel at Barston? Lunch & dinner £11.95-£21.50. Not Sun eve.